This enormous bird is the largest feathered creature on the planet. The ostrich belongs to the ratite family, along with its similarly flightless cousins such as emus, cassowaries and kiwis. It is also the holder of many other records. 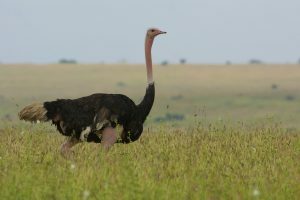 Many authorities now believe the Somali ostrich, of arid parts of East Africa, to be a separate species from the common ostrich found elsewhere. An ostrich can reach a speed of 70kmh. This is not only the fastest land speed of any bird, and the fastest of any two-legged creature, but also faster than most birds can fly. When running at full tilt, it takes strides of up to 5m. An ostrich’s eggs are the largest of any bird: at up to 15cm long and weighing up to 1.4kg. They are 20 times the size of a domestic chicken’s. Nonetheless, they are the smallest eggs of any bird – in relation to its body size. Ostriches have the largest eyes of any land animal, measuring up to 5cm across. This helps them to perceive predators at a great distance. Heavy eyelashes help shield them from the sun. It is a myth – probably first perpetuated by the Roman historian Pliny the Elder (AD23–79) – that ostriches bury their heads in the sand. However, they do habitually ingest small stones and pieces of gravel. These particles, known as gastroliths, lie in the bird’s gizzard where they help grind down its food. The word ratite – the group of flightless birds to which the ostrich belongs – comes from the Latin ratis, for ‘raft’. It refers to the flat sternum of these birds, which lacks the strong keel present in flying birds for the attachment of wing muscles. Thus, even if an ostrich had wings large enough for flight, it would not be able to generate enough power to flap them.